Yes, you heard it right. 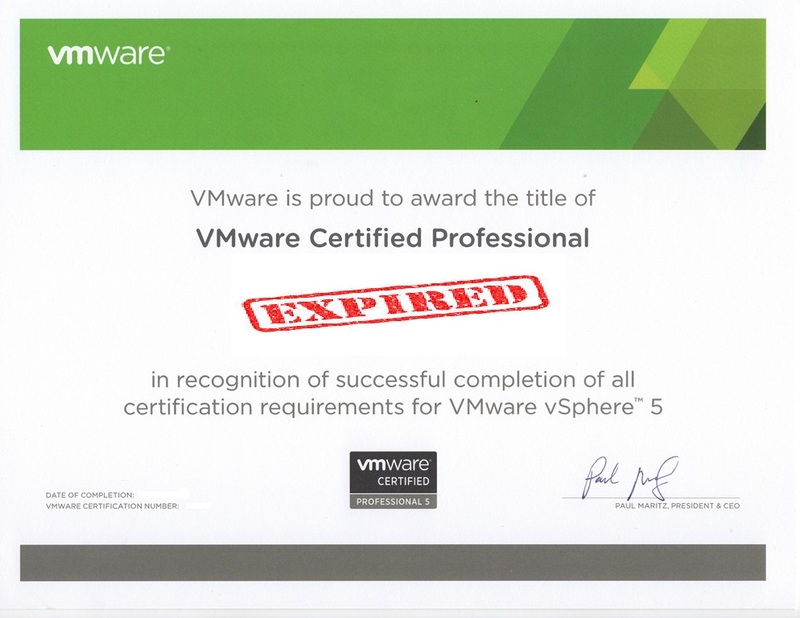 VCP Certifications now come with an Expiration Date. Just like all certifications(At least most of them in the industry), VMware too, has decided to impose an expiration date on all its VCP Certifications. All the Certifications that are already given out and will be given out will come with a “Valid Through” Attribute which will say till when you will be holding the certificate before it expires. You will see this message if you login into your MyLearn account and go to your Transcripts. The Validity of a VCP Certification is now two years. Once you are certified you will need to get a re-certification after two years. For all the Certificates that were issued before March 10, 2014 their “Valid Through” dates are mentioned on your My Learn account. For those who took the exams after March 10, 2014 the certifications will be valid for another 2 years since the day the certification was taken. One can Recertify and get the certification valid for another two years. Advance to the next level by earning a VMware Certified Advanced Professional (VCAP) certification. I know a lot of you guys will have lot of questions about these changes. The FAQ’s can be found here for the same. I personally feel that its not a big deal as most of us are used to re-certification. VMware being a company which releases frequent product updates and releases will need one to re-certify and stay updated even if its not a compulsion. The fact that there is no course completion involved with re-certification is a good thing to know. What do you guys think about this change?